Apple TV is a media player made by Apple that incorporates the minimalistic design and fluid functioning that has become characteristic of Apple computers and devices. With the unprecedented popularity of YouTube and other media sharing sites online many people have started watching TV or videos online rather on a television set. Unfortunately, this also means that the videos are often small and grainy on a computer screen, which can make it frustrating to watch them. Apple TV addresses this problem by allowing people to watch videos that are posted online on a television. 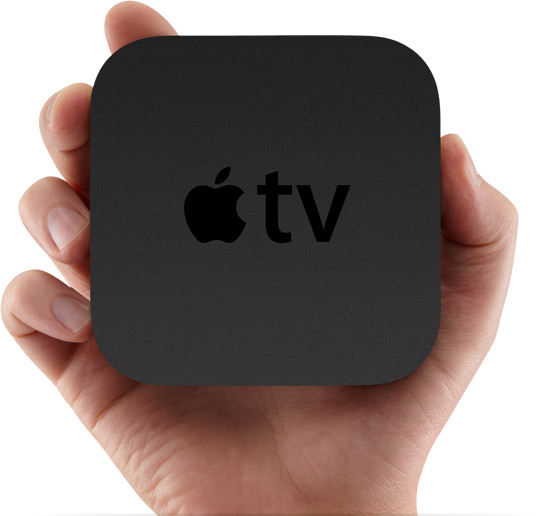 The most recent version of Apple TV is about 80% smaller than the original and has access to Netflix streaming. Now users can watch TV shows and movies with their Apple TV. The streamlined design of the Apple TV means that it can fit with any decor, and the owners do not need to worry about the design standing out or taking up too much space in a crowded entertainment centre. With a simple and stylish remote, there are no confusing buttons which means no time wasted trying to get to the menu or frustrating attempts to play the video you want. Keeping everything neat and organised is Apple TV’s on cable connecting it to the TV. There is no need for complicated cables that make a big mess behind the entertainment centre. Once the cable is connected, there is no more need to worry or hook up the Apple TV every time it is used. Playing videos that are on an iPad, iPhone or iPod touch on a large-screen TV is now possible with the Remote App. Quickly find the exact video you want on your touch device, then sit back and enjoy it on your high definition TV – about as simple as it gets. The wireless connection to your iTunes library means you can watch any video in the iTunes store. Whether you have a season pass to your favourite shows, or you want to buy an episode you missed or rent the latest blockbuster you have access to them all. Apple TV also lets you pull up the photos from your latest trip on flickr or your mobile me account so you can show guests the details of your trip in crystal clear definition instead of passing around hardcopies. AppleTV also allows you to listen to internet radio through your TV, making sure that your next party will have a great soundtrack that is varied.